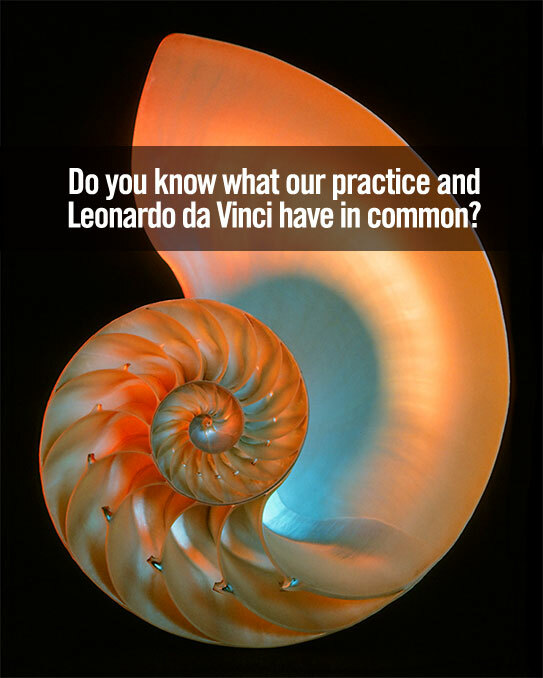 DID YOU KNOW THAT HIGHLY SKILLED COSMETIC DENTISTS LIKE DR. BEHNER often use Leonardo da Vinci’s “Principle of Divine Proportion” when designing new smiles? It’s true. When it comes to smile design, many factors must be taken into account including the patient’s age, lifestyle, and physical characteristics. In addition, there are other truisms associated with your teeth themselves that Dr. Behner and the rest of our practice must consider—including the fact that our teeth tend to get shorter with age as they wear. Much like a fine oil painter working on a canvas, Dr. Behner takes his artistic inspiration and experience and transforms them into awesome smiles. In some cases, procedural and design techniques include tooth lengthening or shortening. Veneers are also considered sometimes to widen your teeth or broaden a smile. Crowns can bring subtle, yet totally different dimensions to a patient’s facial proportions. Most people are surprised with the stunning difference even the smallest of adjustments can make. It’s a fusion of science and art. We look forward to seeing you the next time you visit our practice!